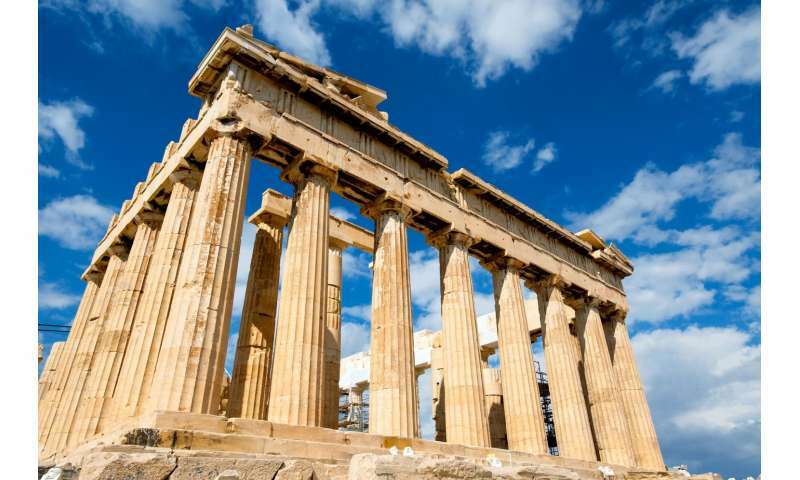 The Ancient Greeks may have built sacred or treasured sites deliberately on land previously affected by earthquake activity, according to a new study by the University of Plymouth. Professor of Geoscience Communication Iain Stewart MBE, Director of the University's Sustainable Earth Institute, has presented several BBC documentaries about the power of earthquakes in shaping landscapes and communities. Now he believes fault lines created by seismic activity in the Aegean region may have caused areas to be afforded special cultural status and, as such, led to them becoming sites of much celebrated temples and great cities. Scientists have previously suggested Delphi, a mountainside complex once home to a legendary oracle, gained its position in Classical Greek society largely as a result of a sacred spring and intoxicating gases which emanated from a fault line caused by an earthquake. But Professor Stewart believes Delphi may not be alone in this regard, and that other cities including Mycenae, Ephesus, Cnidus and Hierapolis may have been constructed specifically because of the presence of fault lines. Professor Stewart said: "Earthquake faulting is endemic to the Aegean world, and for more than 30 years, I have been fascinated by the role earthquakes played in shaping its landscape. But I have always thought it more than a coincidence that many important sites are located directly on top of fault lines created by seismic activity. The Ancient Greeks placed great value on hot springs unlocked by earthquakes, but perhaps the building of temples and cities close to these sites was more systematic than has previously been thought." In the study, published in Proceedings of the Geologists' Association, Professor Stewart says a correspondence of active faults and ancient cities in parts of Greece and western Turkey might not seem unduly surprising given the Aegean region is riddled with seismic faults and littered with ruined settlements. But, he adds, many seismic fault traces in the region do not simply disrupt the fabric of buildings and streets, but run straight through the heart of the ancient settlements' most sacred structures. There are prominent examples to support the theory, such as in Delphi itself where a sanctuary was destroyed by an earthquake in 373BC only for its temple to be rebuilt directly on the same fault line. There are also many tales of individuals who attained oracular status by descending into the underworld, with some commentators arguing that such cave systems or grottoes caused by seismic activity may have formed the backdrop for these stories. Professor Stewart concludes: "I am not saying that every sacred site in ancient Greece was built on a fault line. But while our association with earthquakes nowadays is that they are all negative, we have always known that in the long run they give more than they take away. The ancient Greeks were incredibly intelligent people and I believe they would have recognised this significance and wanted their citizens to benefit from the properties they created."